Tarot is a divination system which facilitates introspection and welcomes Divine guidance. Employed with open-hearted curiosity, the practice illuminates our lives by clarifying access to inner wisdom. 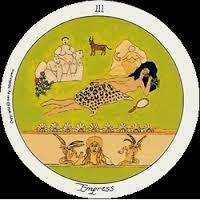 The Motherpeace Tarot is a round deck with healing imagery from world traditions. “The Motherpeace Tarot has been a wise and loving oracle. For individuals, couples and groups seeking inspiration, insight, empowerment and harmonious understanding. Sandra Kammann has been consulting the Tarot for thirty two years for personal growth and as a catalyst for creative expression. Sandra studied tarot with Vicki Noble, creatress of the Motherpeace Tarot deck and texts, and with Susun Weed, internationally recognized Wise Woman herbal healer and founder of Ash Tree Publishing. Sandra is both dancer and actress, and founded the visionary Sister’s of One Eye dance/theatre Troupe. She has a Master’s degree in Cultural Anthropology: Performance of Myth & Ritual, and an M.F.A in Performance, graduating with honors from The George Washington University.